Police and soldiers are being deployed in large numbers to Brazil's northeast to fight a wave of gang violence fueled by the overloaded, collapsing prison system. 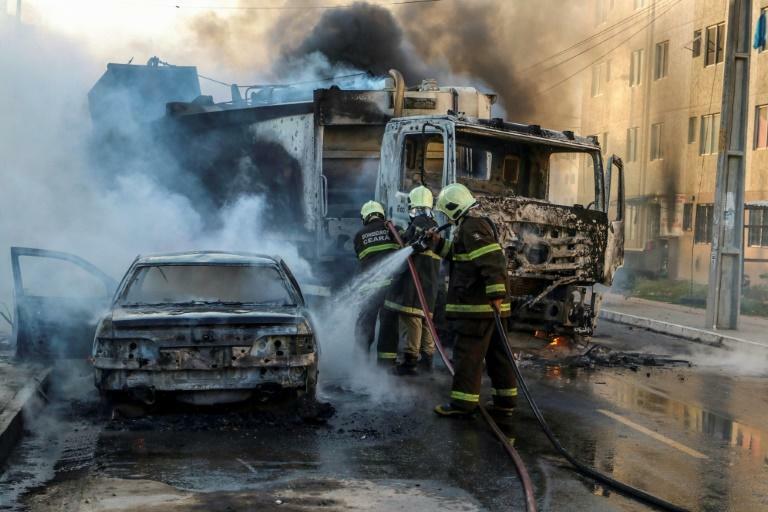 More than 400 elite federal troops have been sent to the city of Fortaleza and the rest of Ceara state to reinforce overwhelmed local cops, who face a dramatic rash of attacks on government buildings, buses, police stations, banks and bridges by well-armed gang members. The deployment, now in its third week, was requested by the state's leftist governor but authorized by Brazil's new government. It is the first test of far-right President Jair Bolsonaro's tough law-and-order stance. Since the deployment the number of daily violent incidents has dropped but not stopped, and many locals are staying at home for fear of being targeted. The gang attacks were triggered by new, hardline rules imposed in the state's prisons, according to Brazilian intelligence reports leaked to the press. These include an end to separating inmates of rival gang affiliations, and blocking cellphone service for crime bosses who direct their men from behind bars. 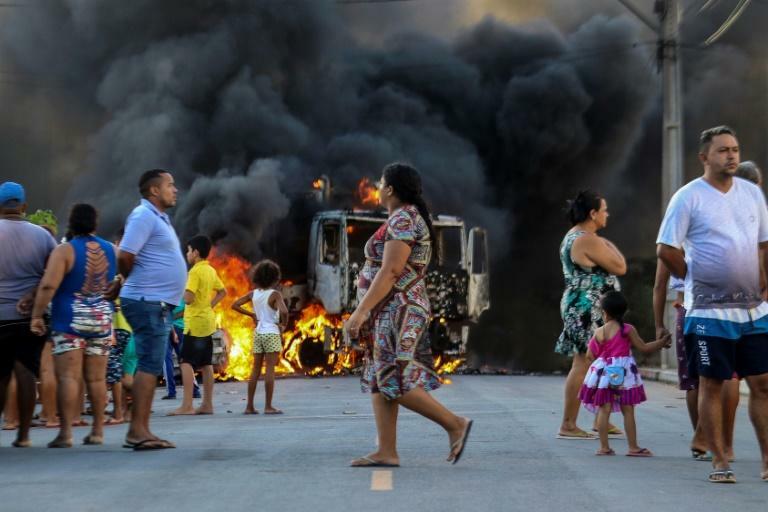 The crisis, which detonated just after Bolsonaro took office on January 1, "is just the visible part of the pressure cooker that is Brazil's prison system which, from time, blows up," said Camila Nunes Dias, a professor at the ABC Federal University. "The prisons feature subhuman, overpopulated conditions without the physical infrastructure or sufficient management by the government," said Nunes Dias, who studies criminal groups fighting over Brazil's narcotics trade. With 720,000 people behind bars, Brazil has the third highest number of incarcerated people in the world, behind the United States and China. In many cases, Dias said, the inmates run the prisons from the inside because authorities can't get organized to provide even basic items, such as food and clothing. In Ceara, for example, the prisons are at three times their capacity. Trying to seize back control, the state's new prisons secretary, Luis Mauro Albuquerque, imposed the tough rules limiting the ability of locked-up gang chiefs to keep running their outfits. "We need to show that it's the state that is in charge," Ceara governor Camilo Santana said after meeting Brazil's justice minister, Sergio Moro, in Brasilia on Thursday. Moro, a former star anti-corruption judge, agreed to send 400 federal troops and 90 prison officers to Ceara. Authorities have also moved dozens of incarcerated gang leaders to maximum-security federal penitentiaries, and called up 800 reserve police officers to reinforce patrols. Moro is also looking at ways to stop the crime gangs from running their drug operations even while behind bars -- a problem also in prisons in Sao Paulo and Rio de Janeiro, and in northeastern states known for their high levels of violence such as Pernambuco and Rio Grande do Norte. One of the steps the government is seeking is tougher laws. "Things that happened should never have happened -- using bombs to blow up flyovers, bringing down energy transmission towers. This can only be classified as terrorism," said Santana. "There needs to be legislation." The leftist governor agrees with some of the right wing government's tough-on-crime policies. But he and many others are against a decree Bolsonaro signed last Tuesday that makes it much easier for "good" citizens to own guns to counter armed criminals, and a proposal to reduce the age of criminal responsibility from 18 to 16. For Nunes Dias, these measures will only result in more people being sent into a prison system already chronically overwhelmed. What Brazil needs, she argued, is a policy that over the long term reduces the number of inmates. Improving prison conditions is also necessary to increase the chances the inmates can be rehabilitated through study and work, and undercut the current role of prisons as schools of crime. Prevention is also needed "so children and teens get another perspective, of a life of dignity away from the world of crime." Cracking down inside prisons without seeking to alleviate root causes "is putting a bandaid over the pressure, but the problem is continuing there," she said.